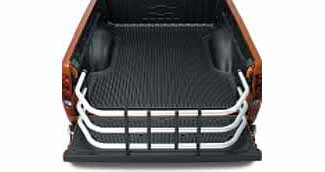 Stretch the capacity of your cargo bed with this Bed Extender. Compatible with bed liners and tonneau covers, it swings out to provide additional functional length over an open tailgate, or swings in to create a contained cargo area. Cargo and load capacity limited by weight and distribution. Secure loose items before driving. Brushed Aluminum.